We at the plant nursery company of Ishii Seed Growers Co, Ltd are day by day researching thousands of combinations of cabbage, Chinese (napa) cabbage, flowering kale, etc; striving to meet the needs of our customers by improving our breeds and also working to ensure a stable supply environment. This, as well as developing food culture and building up the Ishii brand is what we are truly committed to. 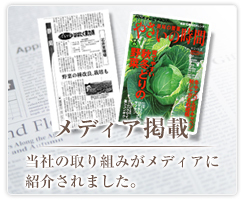 Company name : Ishii Seed Growers CO., LTD.
Business line : Improving strains of cabbage, Chinese (napa) cabbage, flowering kale and others in the brassicaceae family ; seed production and sales. Ishii Seed Growers CO.,LTD. established its research facility in Shizuoka City in 1959. Since then research has been conducted, focusing on cabbage and also Chinese (napa) cabbage and flowering kale to improve our strains. Ishii Seed Growers CO.,LTD. believes in the need to avoid any falls in quality or production due to abnormal weather. Accordingly we have begun research in places, overseas and of course Japan, that meet our safety standards. Copyright © 2008 種苗会社の有限会社石井育種場 All rights reserved. Copyright © 2008 石井育種場 All rights reserved.